The Minnesota Multiphasic Personality Inventory (MMPI, MMPI-2, and MMPI-A) and the Rorschach are the two tests used most widely in clinical personality assessment to evaluate personality functioning, current emotional state, and the presence, nature, and severity of psychopathology, as well as to formulate treatment interventions. Psychologists' vigorous interest in and intense loyalty to the Rorschach and MMPI are reflected in the large and still growing theoretical and empirical literature concerning these tests. Given the enduring popularity of these two tests, it is surprising to find that only a small percentage of these numerous studies have examined the relationships between the two. Both tests provide valuable information about an individual's symptoms, behavior, emotions, interpersonal functioning, self-concept, defenses, and the dynamics underlying their behavior. Although much has been written about each test individually, little has been written about how to use the two tests together even though many psychologists use a battery of tests when conducting personality assessments in clinical practice. The basic premise of this book is that psychologists' armamentarium of assessment techniques can be strengthened by using the MMPI-2 and Rorschach together in a complementary fashion, and that essential information may be lost if one test is used to the exclusion of the other. 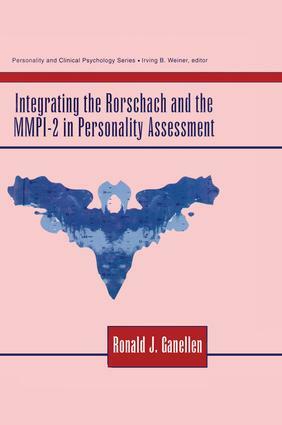 The book examines interrelationships between the MMPI-2 and Rorschach on several different levels including empirical and research findings, conceptual relationships, and integrated interpretations using a series of in-depth case presentations. A balance is maintained between the foundation provided by research and by clinical theory for conceptualizing, understanding, and treating patients with a variety of psychological disorders. This volume illustrates the contribution psychological test findings make to clinical decision making and differential diagnosis, and discusses the links between test data, clinical judgment, and DSM-IV. Case 3: Adolescent Alienation- or Psychosis?